Alcala is located close to Madrid, and is also the city where Don Quichote de la Mancha was created. Its university is one of the oldest in the World. It hosts a very dynamic Space Weather group under the leadership of Consuelo Cid. In this group, Antonio Guerrero found himself very attracted by the Planeterrella after a demo in Brussels. Both Antonio and Consuelo fought hard to build their own, using parts of the first Planeterrella ever built. They did construct even their power supply themselves, which is a tough task, but worthwhile if one wants to make good measurements. From left to right, you can see Dr. Judith Palacios Hernández, Prof. Dr. Yolanda Cerrato Montalbán, Prof. Dr. Consuelo Cid Tortuero, Prof. Dr. Elena Saiz Villanueva and finally Ph.D. Student Antonio Guerrero Ortega. The High Voltage Power Supply was built from spare parts. This means that building one of this power supply is very dangerous and it can be successful only for people with experience working with electricity and specially high voltage (if you doubt, do not even try). It consists of three main parts, a power regulator (one of those used for dimming lights), the main capacitor and an ignition coil (one of those used on motorbikes). 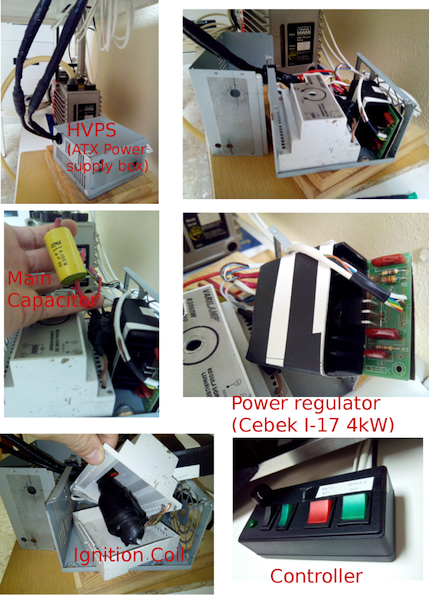 Several configurations where made for different power regulators and different capacitors. It is recommended to use a power regulator that supports more than 2kW, and a film capacitor between 1 and 10 microfarad. The value of the capacitor is the most important part in order to get different results for Planeterrella’s purposes. 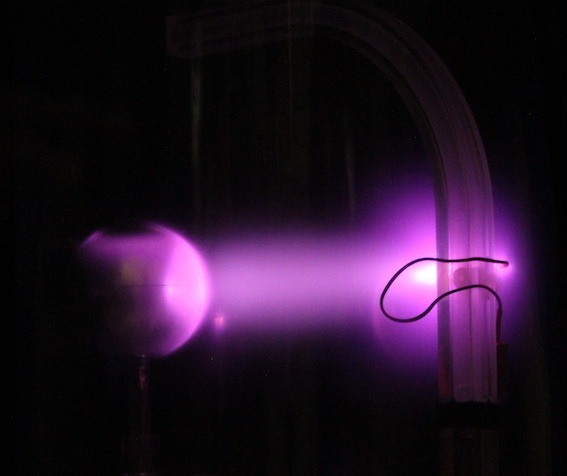 If you would like to know more, you can contact Antonio Guerrero Ortega (aguerrero@uah.es), Space Research Group at University of Alcala, Spain. Hereafter is a set of pictures of this power supply. This Planeterrella is of model I type, with a plexiglas chamber. 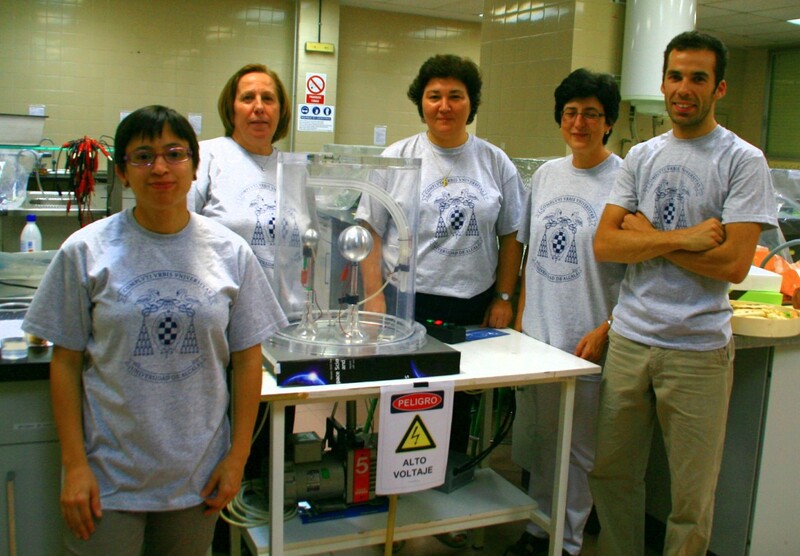 It was completed just on time for the "night of the researchers", a big outreach event in Madrid, in September 2013. 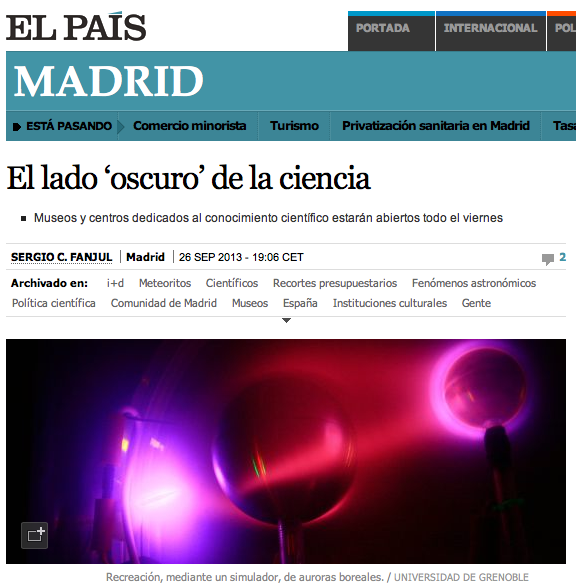 It attracted immediately several hundreds of visitors and even got the honor of an article in the national journal "El Pais". The picture shows a very bright Van Allen Belt. The northward auroral oval is clearly visible. The group of Alcala created a beautiful logo for the Planeterrella, inspired from the one made in France, but still improved !